I was recently asked via email to answer some questions regarding obesity for a student’s research paper. Here are some of my answers which I thought I would share. These questions are great and I hope I did them some justice. What inspired you to do more with the community outside of your field of practice? I think I make some decisions which may seem strange, but I like to believe that they are well thought out. I’m originally from New York. In high school, I got accepted to many great universities including Brown University, Harvard, Stanford., etc. I chose to go to Brown for their wonderful program in medicine. I met my wife, Plastic Surgeon Dr. Tammy Wu, at Brown University. She subsequently graduated as the top female student in the medical school program. We started to come to the conclusion that education is what you make of it for yourself, and that applies to where you live. Your community is what you make of it, and we have the responsibility to create and sustain our own environment. A few years after college when I was in my 20’s, I was running a marathon in California and it was during a hypoxic moment during that marathon that I decided that I was going to move to California. Thus I applied for surgery jobs in California. I had then received job offers in San Diego, Orange County, Los Angeles – but turned all those down – and decided on taking a trauma and general surgery position in Modesto, California. Here’s a link to that medical group which I joined in Modesto. 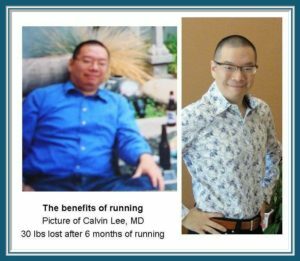 A few years later I decided to become an acupuncturist, and while on that journey, I met a few folks in Modesto who had the dream of starting a Marathon in Modesto. I remembered that it was marathon running which brought me to California in the first place. I had often thought that it would be nice to have a marathon in Modesto. At that time I joined my wife’s practice and we named our joined practice, Surgical Artistry. 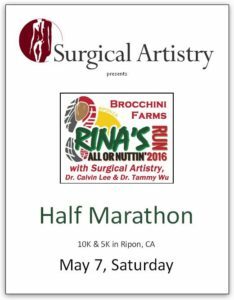 Through Surgical Artistry, we were able to support the creation of a new marathon in Modesto – it was dubbed the Surgical Artistry Modesto Marathon. I have since also become a cosmetic physician with injections of Botox and Fillers. I joke that half of my practice is acupuncture, and the other half is Botox, and then yet another half is surgeries. I am also involved in the classical music world in Modesto. We were founders of the Gallo Center of the Arts in Modesto and supporters of the Modesto Symphony. In summary, we believe that our community is what we make of it, and it requires effort – just like my initial belief about taking responsibility for my own education. While I was working as a trauma surgeon, I’ve come to realize some of the gang related problems with our town, and I was really seeing the worst part of Modesto. I think that has really motivated me to do the opposite and try to focus on the positive aspects. The first newspaper advertisement for the Surgical Artistry Modesto Marathon back in 2009. 2. Why do you think it is important for every community to try and live a healthy lifestyle? Health is a basic foundation of our lives. And our lives make up the community. Thus if we have personal health, then we can focus on making the rest of the community a better place. That is true for our own families as a microcosmic example. I think we can live by example, and then spread health to others, but it really starts with ourselves. And the community itself is a vibrant organism which needs health as well. So it’s my belief that health leads to a kinder and more compassionate community. Also, if health was a currency – it would be so much more valuable than money. 3. What suggestions do you have for motivating families to become more physically active? As a doctor, I learn from my patients. I had a particular patient who has been running for most of his life. I asked him how he did that. He said that he saw running as part of his job, and that his job wasn’t done until he got his running done. I have many patients who are so dedicated to their jobs that they feel that they don’t have time for exercise. Thus, I try to tell them to consider exercise – such as walking outside – as part of their job. I am now in a cosmetic surgery environment, and many of my patients are conscious of their youth. They come to me for Botox and other facial injectable procedures. I tell the patients that exercise is one of the ways to bathe the body in repair mechanisms and growth mechanisms to keep our entire bodies young. The above two paragraphs refer to strategies I have for adults. As for kids, I encourage them to join group activities in school which involve physical activity. I try to help support a group called Teens Run Modesto which allows for kids to run as a group socially – especially before a workout. It also holds them accountable, and they meet other like-minded kids and mentors. It’s an amazing group. What I’ve observed from the Teens Run Modesto program is that when the kids are active, the parents start to want to participate too. I think some people call this the “Disney Effect.” If the kids do it, then the parents do it too – like visiting Disney World or Disney Land. I recently learned this concept from the founder of a fitness minded group in Modesto. And hopefully families will think of social activities to do together which involve more physical activities such as hiking or gardening instead of just passively watching movies. It would be great if the kids would take the lead in their families health. It does make quite an impact on the adults. Although I do support movies as a form of art. I am also passionate about art. 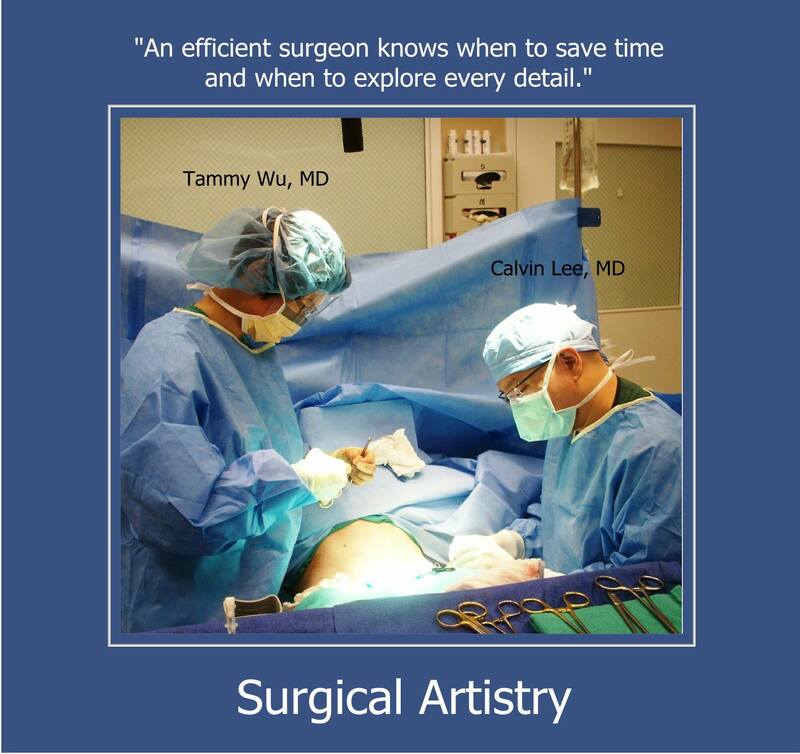 I see much of what I do as a surgeon as a form of art as well. 4. According to recent studies, one in every three children are considered to be obese/overweight. Do you think those rates are going to continue to increase over the next few years? I think they would increase in the next few years. But it’s our job to try to decrease this rate of increase until one day, hopefully, we will decrease our rate of obesity. I’m hoping that with social media, crowd-effect and education that we will once again be closer to our ideal Body Mass Indexes. I am personally vegan, and I hope that there would be more vegans again in the world. Things tend to go in cycles, and perhaps one day vegans will dominate again and hopefully be healthy vegans rather than potato chip and soda type vegans. If we keep ballooning out at this rate, then we will be lost and our general lifespan on earth will surely decrease. 5. If any at all, what recommendations would you make to professionals in health care services and education industries in raising more awareness with obesity? Health care professionals need to emphasize prevention of disease. Obesity itself is a disease. Health care professionals should consider leading by example, and we should all immerse ourselves with the latest studies on nutrition. I believe that although there are some complexities of how our bodies process foods, and how our bodies hang on to fat – the first law of thermodynamics apply to our bodies: where increasing our calories spent and decreasing our calories eaten will lead to weight loss. Yes, there are other hormonal factors at play, but calories in and calories out are things that we can measure and thus manage more effectively. There are calorie / step counting watches that make calorie expenditure more fun, and if that is what helps, then I support it. One thing we have to do as health care professionals, I think we have to stop caving into consumer demand for a quick fix. We should be slower to offer that pill or that surgery to fix problems, and try to make patients more accountable for their outcomes. 6. What steps have you taken to reach out to the community? Do you think it was successful and how do you think it will be sustained over the next few years? 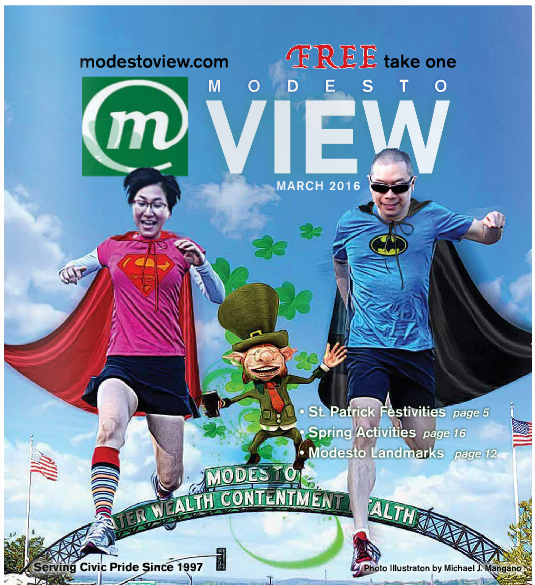 I’ve helped to create a new marathon for Modesto. I helped to set up training groups for adults and teenagers for this marathon (which includes other distances like a half marathon and a 5K). In combination with eating more of a vegan diet, I believe that running is one of the most efficient and effective methods of losing weight. I’ve joined in with my local vegan group. And I participate sometimes in our local online facebook pages regarding running and eating well. I think all these efforts have been somewhat successful. We haven’t exactly come up with ways to quantify the differences that we’ve made in this community. But I can say that I definitely, without a doubt, see a lot more runners in our parks in Modesto. It’s like an army of runners. I am now branching out into nearby towns such as Ripon and Manteca for training groups and running events. 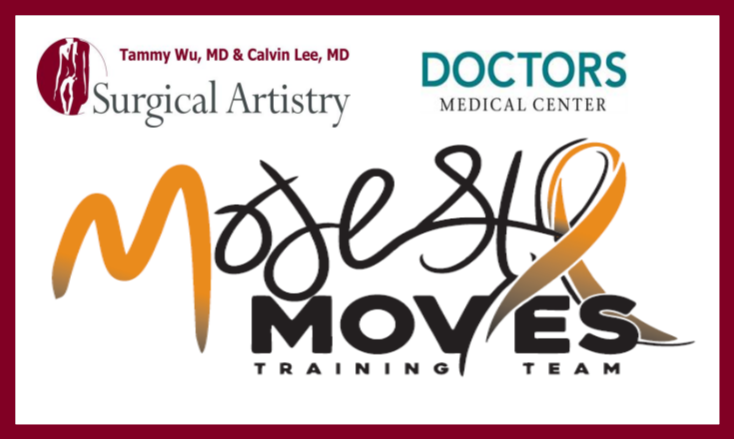 I just recently started financially supporting (via sponsorship) a group known as Modesto Moves and it just started last Saturday and has about 240 members – walkers and runners. 7. Final question. Do you think it is more important to educate children or adults when talking about obesity and its effects? Great question. I think if I had to pick one. I would say, educate the children. They are the future, and children have a way of educating adults in a positive manner. As for the other way around. I don’t think kids listen to their parents when they say “Eat your broccoli.” Educating kids is also educating them at a point where they can prevent obesity and its associated diseases. So like any disease – it’s good to catch them early or before it even begins. Thus we should educate the young and focus our energy there. 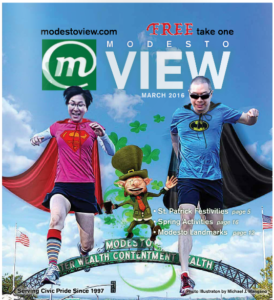 Dr. Tammy Wu and myself on the cover of the March 2016 issue of Modesto View Magazine. We’re trying to make a difference. Thank you Modesto View for this rare opportunity. Tummy tuck is not a solution for obesity.